This book examines sports psychology from a skydiving lens. Sports psychology, a science that studies how psychological factors affect performance, is used by professional athletes and sports teams to obtain peak performance. If other athletes use it to achieve their best, why can’t we? Here are our thoughts. This book has a heavy focus on themes of awareness, mindfulness, health and communication; which can be a treasure trove for some and a den of wolves for others. By becoming more aware of ourselves, communicating more efficiently and authentically, and being in tune with the needs of our fellow jumpers, we have all the essential tools needed to rule the skies! Do you really know what’s going on in that mind of yours? Take this simple awareness exercise: think of a situation you are about to tackle, like your next skydive. Pinpoint and write down your mental and physical reactions. While this exercise may not seem fun at first, it is actually an essential part of attaching physical performance to particular feelings. Just being aware of your own reactions is the first step to happier and more successful jumps! We all daydream. We visualize vast, and sometimes even embarrassing stories in our head. But do we control these daydreams? The author, DeRosalia, tells us how to hone our brain's natural ability for imagery so that you can successfully train yourself through a skydive while waiting for the next load. Setting measurable goals and creating a plan to achieve them doesn’t always come naturally. In Mental Training for Skydiving and Life, the author gives us an easy way to alter achievement plans and goal trackers to help keep ourselves accountable and continue to progress in the sky. In the skydiving world, we become a loving and close-knit family. Nevertheless, at times we can annoy the pants off of each other too. DeRosalia reminds us how to find what we like in everyone, leading to better relationships, better teamwork, and better skydives. We all come from different backgrounds, have different learning styles and, many times, different native languages. These differences are part of what makes the skydiving community so interesting, but sometimes these differences make effective communication a little more challengind. The team communication section in Mental Training for Skydiving and Life gives a great overview of various communication techniques and exercises and how we can use them at the dropzone. As DeRosalia points out, performance anxiety is our brain’s way of protecting us from making mistakes. But it can also be crippling. The book goes in depth on performance anxiety and details techniques to deflect it and recenter yourself. These techniques range from easy and enjoyable, like singing your favorite song, to just plain weird - like dramatically changing your body position. If you struggle with performance anxiety, these techniques might just be your ticket to calmer skies and better jumps. Pick this book up! Whether you struggle with mental training and communication, or you can’t get enough of it, you will find something useful in this book. Read the whole thing, or flip to the subjects that you want to work on. Either way, this book will help you have better skydives, better communication, and more self-confidence! Do you have a favorite skydiving book you want us to review? Let us know! 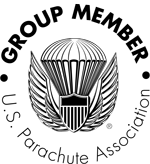 Want to start your skydiving career? It's not too late to schedule your first skydive!